Due to the difficulty with selecting engines, several different types were installed. The first prototype numbered B.9952 was powered by two 200 hp (149 kW) Hispano-Suiza engines. This is listed as the Mk I. It was later powered with two 260 hp (194 kW) Salmson water-cooled radial engines. The Salmson engine version was not developed further. The third prototype numbered B.9954 was powered by two 260 hp (194 kW) Fiat A-12bis engines. The Fiat version of the F.B.27 was proved to be good and was ordered in quantities. This is listed as the Mk III. However, this aircraft was destroyed in September 1918 after a test flight with live bombs. The bombs exploded and destroyed the airplane, killing the pilot. There was a Mk III version listed in the Technical Department Instruction No. 538A, dated January 1919, powered by two 230 hp (171 kW) B.H.P. engines but it is not known if any airplanes were completed with these engines. The Americans were interested in the Vimy and requested to have Liberty engines installed. A trial installation was made, but it was destroyed by fire at Joyce Green. Construction was conventional, but the fuselage was made of steel tubing with a fabric covering. The forward section was wholly of steel tubing, while the rear center-section struts were hollow spars. The wings were in three sections with the center-section between the engines and the outer panels having a slight dihedral. Ailerons were horn-balanced on both upper and lower wings. The tail-unit was a biplane structure with twin rudders. There was a gunner's position in the nose and another behind the wings. The Vimy is remembered more for its record breaking flights after the war. 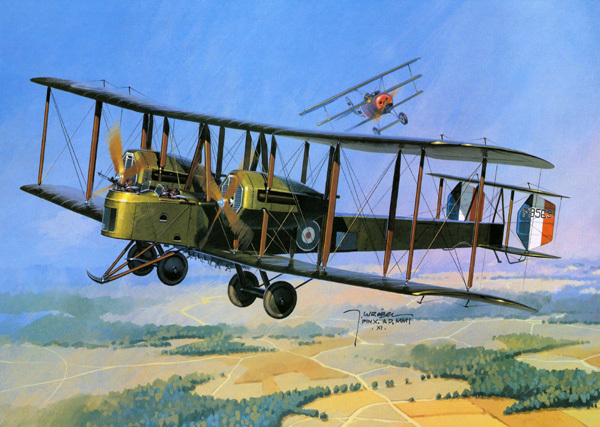 Alcock & Brown made the first transatlantic flight in a modified Vimy IV. The flight originated in St. Johns Newfoundland and landed at Clifden, Ireland with fuel for another 800 miles of flight left. The aircraft is preserved in the London Science Museum. 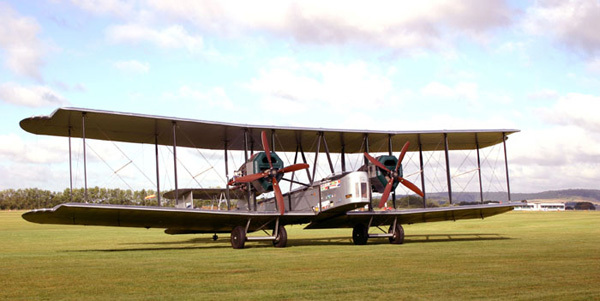 A Vimy IV also made the first flight from Britain to Australia. The flight was flown by Captain Ross Smith with his brother Keith Smith as navigator and they were accompanied with Sergeants Bennett and Shiers as mechanics. They left Hounslow on November 12, 1919, and arrived in Port Darwin on December 10th, 11,000 miles away. The aircraft G-EAOU is preserved in a museum in Adelaide, Australia. In 1920, a Vimy attempted to make the first flight from England to South Africa. Wing Commander Pierre van Ryneveld, and Flight Lieutenant C. J. Quintin Brand left Brooklands, with two mechanics, on February 4, 1920 in the Vimy G-UABA named Silver Queen. They landed safely at Heliopolis, but made a forced landing 80 miles (130 km) from their final destination, Wadi Halfa, due to engine trouble. A second Vimy, named Silver Queen II, was lent to the crew by the RAF at Heliopolis, but was overweight and crashed at Bulawayo in Southern Rhodesia on takeoff. The flight was completed to Cape Town on March 20, 1920, in a D.H.9 lent by the South African Air Force. Two 360 hp (268 kW) Rolls-Royce Eagle VIII V-12 liquid-cooled engines. (Typically) Four .303 caliber Vickers machine guns. Bombs load 4,804 lb (2,179 kg). 1. J. M. Bruce. British Aeroplanes, 1914-18. New York: Funk & Wagnalls, 1957. 697. 2. Kenneth Munson. The Pocket Encyclopedia of World Aircraft in Color. Fighters 1914-19. Attack and Training Aircraft. New York: The MacMillan Company, 1969. 153. 3. J. M. Bruce. 701. ©Larry Dwyer. The Aviation History Online Museum. All rights reserved. Created April 17, 1997. Updated November 18, 2013.